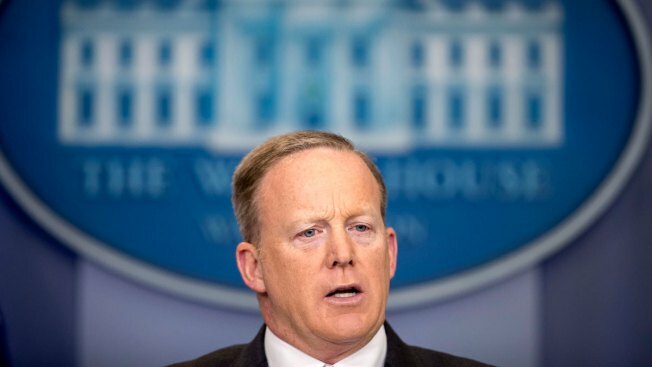 White House press secretary Sean Spicer talks to the media during the daily press briefing at the White House in Washington, April 17, 2017. Spicer discussed the president's tax returns, policy on White House visitor logs and other topics. The Rhode Island Republican Party is holding a fundraiser to honor White House press secretary Sean Spicer. The fundraiser is scheduled for Sunday. Spicer grew up in Barrington, Rhode Island. Tickets for the event cost a minimum $250. Tickets to a private VIP reception before the event cost $1,000. The party has not publicly released the location of the event, and says it will only be disclosed to attendees.